In 1977, L.A. gallerists Claire Copley, Morgan Thomas and Connie Lewallen created the Foundation for Arts Resources (FAR). The goal of their organization was simple: to support and promote artists and the creation and presentation of conceptual art outside traditional gallery spaces. FAR is a nomadic, dynamic organization. It has no permanent home, office or staff. Its bylaws demand that its volunteer board of directors pass the baton of leadership to colleagues when their service is complete, effectively instituting term limits and guaranteeing the influx of fresh ideas. Despite its nontraditional characteristics (or maybe because of them), FAR has existed continuously for the last four decades, popping up sporadically over the years in diverse locations across Southern California. With MacDevitt at the helm of FAR’s ship, the organization is celebrating its 40th anniversary with an ambitious project: the FAR Bazaar is a free, two-day “alternative art fair and art collective festival” featuring the works of more than 300 artists. In a nod to the kind of impermanence that has defined other FAR events, the Bazaar takes place inside Cerritos College’s massive old fine arts building, a structure slated for demolition just a few days after the show’s run. 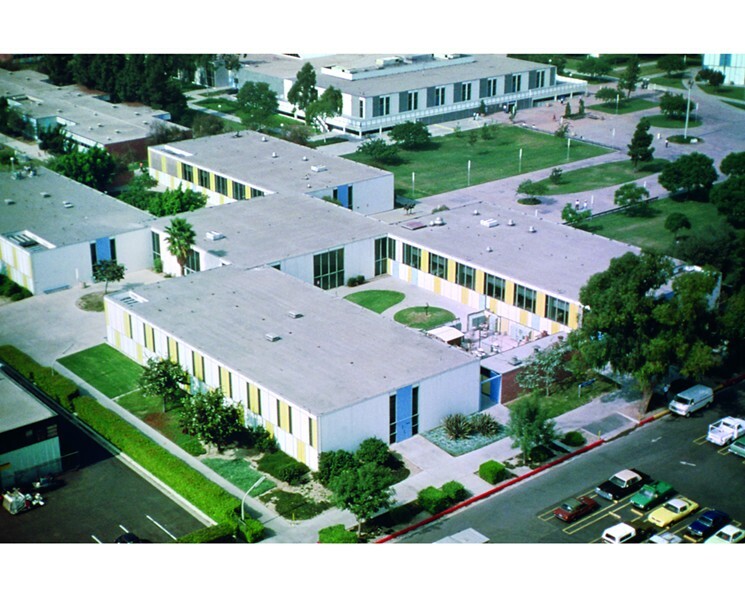 As recently as December, Cerritos College’s old, midcentury modernist fine arts building was still in use. The dean was holding meetings with faculty in his office. Students sketched in drawing classes, threw clay in the ceramics studio and developed photos in the darkroom. Over winter break, everything in the old building was boxed up and moved next door to the big, shiny new facility where students are taking classes this semester. MacDevitt says he and other Cerritos arts faculty members are happy to be out of a space where their lectures were interrupted by falling ceiling tiles, but some are a bit nostalgic for the well-worn charm of the old facility. On Jan. 28 and 29, visitors to the FAR Bazaar will be treated to tours of the new facility, but the main attraction happens in the emptied 1959 building, which will be open from 10 a.m. to 10 p.m. each day. To fill the building with art, MacDevitt reached out to nearly three dozen art collectives and regional MFA programs. Each collective or student group selected one of more than 50 available classrooms, offices, storage closets and hallways to takeover and fill however they chose. In the time between the end of classes last semester and FAR Bazaar’s opening this weekend, they are creating installations, planning performances and painting murals inside and out. 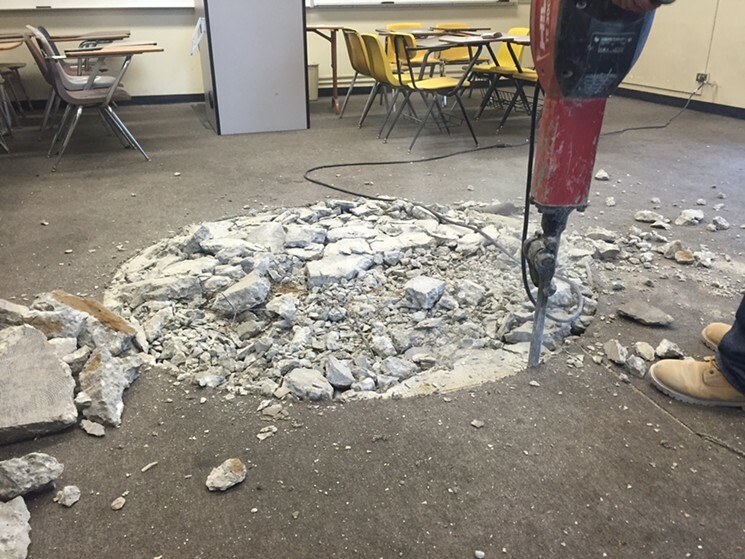 One group has even taken a jackhammer to the floor of an old classroom, digging out a 6-foot-diameter hole and revealing the earth below that has been hidden since 1959. In that same classroom, art collective Hysteric Curators will lead a variety of interactive workshops. During their “Resurrecting Matilda” session, participants will create “Home Wrecker Collages” using old home economics textbooks, which will be torn up and revised, replacing images of perfect 1950s housewives with pictures of more realistic, messy woman. Many of the FAR Bazaar artists are taking advantage of the building’s quirky, built-in design elements. Sound artists from the collective Motherboy are transforming the painting room’s old wooden lockers into a giant percussion instrument, using mics to amplify the sounds of the locker doors slamming as they are opened and shut. In the old journalism room, where recent copies of the school paper, Talon Marks, still line the walls, artists from the Biomythography collective are turning old editorial cubicles into confessionals. The videos that will play in each confessional deal with the representation of blackness in the media and the problems of toxic masculinity. In the ceramic studio’s damp room, Rough Play artist Kim Abeles is lining the old muddied shelves with vases in the shape of a saint’s head and filling them with roses. “When you open the door, you’ll be overwhelmed by the smell of the roses,” MacDevitt says. The list of events, installations and performances happening across just two days is extensive. In the building’s old gallery space, the artist collective/radio station KCHUNG will broadcast live for the entire run of the show. Murals are covering the walls inside and out. The old art history classroom is being transformed into a movie screening space where the art collective Freewaves is putting on a series of screenings. Artists from Elephant are turning one room into a replica of their backyard space and grilling hot dogs for visitors. Juliana Lujan (from the Concrete Walls Projects) is transforming a glass-enclosed cubicle into a pop-up arepas restaurant (reservations are required). The dean’s office will be transformed into a faux immigration office. There are theater performances, poetry slams, endurance readings, flamethrowers and experimental bands. Some of Cerritos College’s professors are putting on intimate shows in their old offices. The list goes on and on and on and on. No matter what time you show up or where you turn in this labyrinthine space, there is art to be discovered. That relationship and connection adds to the emotional impact of this event, as does the Bazaar’s historical significance. Ever the art historian, MacDevitt created this event in part as an homage to past FAR Bazaars and events. In 1992, FAR held its first bazaar at the downtown L.A. Federal Reserve building. Another FAR Bazaar took place in 1994 in the building that's now home to Arts District Brewery. One of FAR’s earliest events, in 1982, involved installations in empty homes that were slated for destruction in the wake of the construction of the 105 Freeway. FAR Bazaar 2017, Cerritos College, 11110 Alondra Blvd., Norwalk; Sat.-Sun., Jan. 28-29, 10 a.m.-10 p.m.; free.